These two things are unfortunately not always easy with such a free flowing sport as paragliding, so we try very hard not only to be good guiding pilots, but to get to know your individual flying style. We do this in the best way possible, by flying with you personally all week. That is why we favour our unique and unusual private guiding ratios, and why we often have such memorable safaris. Like you we are totally passionate about flying, and strive to find the best that Bir has to offer. The most popular choice, 1:1 guiding is the best way to visit those wild Himalayan places, and improve your knowledge and skills as quickly as possible. Whether you are an experienced cross-country pilot or a relative novice, there is no better guiding option. A great option for two pilots of a similar ability to have more personal guidance at a great value price…. One-two gives the possibility of more ambitious flights over the back, especially if you are returning clients and we are familiar with flying together. The Pilot Safari is a holiday - a very flying-oriented holiday that will extend your abilities in the easiest and safest way. We have a suggested itinerary, but tailor each tour to our clients’ wishes and abilities, sometimes splitting the group in the air but always aiming to meet up at the end of the day, whether back in Bir, out for the night in Dharamsala, up in the hills for a wild vol-bivouac or living it up at our fully catered skycamp. The first day or two will usually be flown within a loose group of about 8 gliders, flying an out return on the front ridge. Having a personal designated guide, should your flying speed be faster than the gaggle, you and the guide have the potential to lead off rather than wait. Conversely, should you get stuck low, the guide will be able to come down and help in the search for the climb, before returning to base quickly, so making full use of the day. It is very very rare that anyone bombs out and then only when the conditions shut down, as from a cirrus sheet. We feel confident that we can keep you in the air, making the best use of every flying day. Later in the week, we usually fly to an overnight destination, where we all stay together at a different hotel or bivouac. Then, the following day, we will use a new launch site, the most arduous being a 45 min walk , with horses carrying wings. Should you have a personal ambition, like a flight to Manali, then this can be accommodated within our flexible structure, so long as the guide considers it suitable to your ability, whilst staying within a comfort zone. It would also be possible to make more difficult and ambitious flights over the back, possibly to Manali, or Parasar lake. Each tour will start and finish in Bir and last ten days. There will be seven full days of fly-guiding (taking a rest day allows each day's guidance to be maximised rather than concerns of fatigue compromising safety). Day 1: Out and return flight from Billing to acclimatise, test equipment and assess skills. 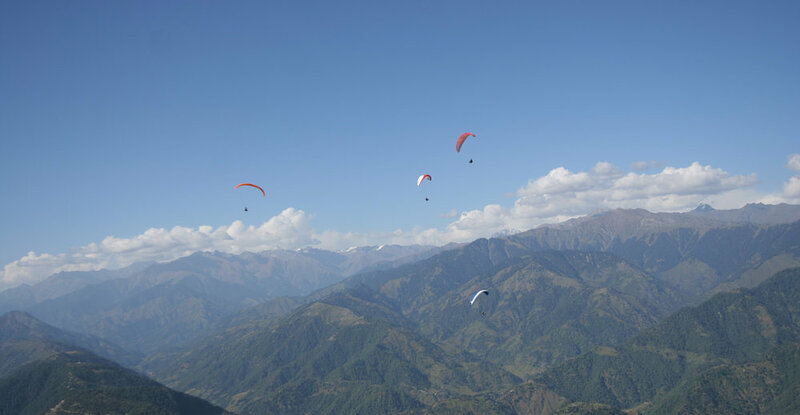 Day 2: Fly 45km to Dharamshala along the main Dhauladhar range and stay the night at Sky Pie in Bhagsu. Day 3: Walk up to Magic View take off (1 hour) and fly back to Bir. Day 4: Over the back into the high mountains above the Barot valley (1:1 and 2:1 only) and then on to the catered camp at 360. Day 5: 360 camp back to top land at Billing for a chai, then down to Bir via Big Face if wished for. Day 6: Billing to Mandi (45km), a beautiful low route giving a unique glimpse into Himalayan village life. Taxi back to Bir. Day 7: Tailor-made to suit pilots’ requirements. Anything from a local bivi to a 100km XC along the Dhauladhar range from Dharamshala to Mandi, or over the back and across the big stuff to Manali. “Hats off to Himalayan Sky Safaris for an EPIC 10 days in Bir, India. Ticked all the boxes I wanted to tick. 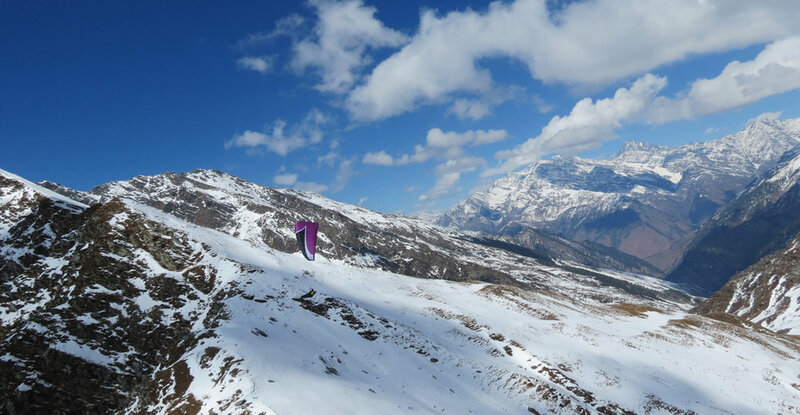 Flying the new Niviuk Artik 3 got three 100+ km days, flight to Manali over the back. Biv vol at 3500 meters with John Silvester (“Birdman of the Karakoram”) and some very healthy shepherd dogs in WAY sub zero temps (thank god for FIRE! ), then a flight back the next day at 5200 meters in strong air and seriously insane surroundings. Holy exposure! This place is just amazing and the boys at Himalayan put on a hell of a trip. Kudos and thank you.